Charlottesville: A Clash of Left vs. Left? On August 12, 2017, a free speech rally arrived in Charlottesville to stop the removal of the statue commemorating Confederate General Robert E. Lee. Then a group of Neo-Nazis, white knights, alt-right trolls, white nationalists, and other white supremacists showed up. They wanted to protect the statue, albeit for different reasons. Then to counter-protest the white (not “Right”) supremacists, the violent left-wing Antifa hordes with their Black Bloc goons crashed the protest, and all hell broke loose. With protesters fighting to pulverize or protect the statue of a general who had headed one side of the American Civil War, another civil war broke out. Or at least it seemed that way. The media played up this fight as a microcosm of the political paroxysm overtaking the United States, and that it was President Trump’s fault. However, a grand total of 100 tiki-torchers had marched the previous night, and then a grand total of 600 extremist rioters had showed up the next day. The (left-wing) mainstream media hyped up this violent clash as a battle between white supremacists on the Right against the anti-fascist Left. Wrong. Both sides are different variants of the political Left. It’s common knowledge that Antifa is as fascist as it gets, using violence and repression to advance their anti-nation, anti-liberty, anti-American agenda. It’s not as well-known that alt-right protesters are actually left-wing agitators, too. One of the rally’s keynote speakers, Richard Spencer, the godfather of the “Alt-Right”, despises the founding principles of our country, including limited government, individual liberty, and the divine origin of natural rights. Dinesh D’Souza’s documentary “Death of a Nation” brilliantly presented in one interview with Spencer what the founder of the Alt-Right movement has expounded on for years. He is a left-wing statist invested in the ultimate authority of the state, socialized medicine, and the nationalization of public lands. He is a national socialist, but a socialist nonetheless. 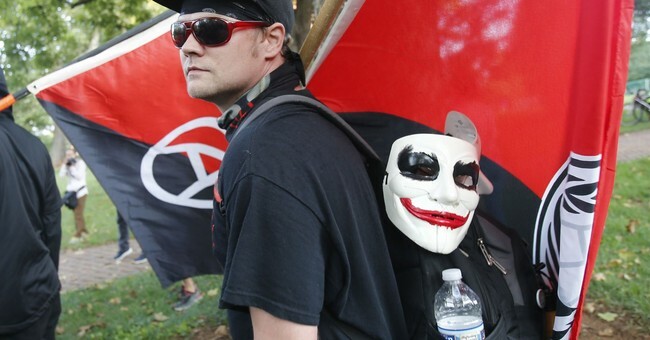 Jason Kessler organized this “Unite the Right” rally, but he’s actually another left-winger. He voted for Barack Obama.He participated heavily in the Occupy Wall Street Movementand once touted himself as a liberal organizer. The reports of Kessler's left-wing leanings came out within days of the Charlottesville clash last year, but few actually read about it. What’s going on, though, in the grander scheme? Why the ongoing confusion about left, right, and the mislabeling of different political groups as we witnessed in the tragic violence of Charlottesville? From grade school to daily news bulletins, our minds are led to see conflicts, political discussions, and even wars as a fight between left and right. This paradigm originates with the French Revolution. During the first sessions of France’s aborted First Republic, the Jacobin radicals sat on the left, and the supporters of the Ancien Regime(the older royal, aristocratic order) sat on the right. Their conflicts focused on who would rule: a king or a collective? The collective won, and with it the tyranny of the Guillotine, relentless riots, and foreign wars. Don’t get me wrong—the French people had every right to rise against royal autocracy which was bankrupting and starving them. But the “cure” proved worse than the disease for the next 80 years until a constitutional republic was established. The two sides of that political fight did not really discuss the proper (as in smaller) size or scope of the state. Instead, the two ideologies of the partisan divide basically retained a large bureaucratic state, welfarism, subsidies, high taxes and fees as the norm. Individual liberty, limited government, and constitutional rule did not factor into the French Revolution’s initial political reforms. However, those on the Left wanted an absolute reduction of differences, equality at all costs. Consider that Robespierre and his blood-thirsty cronies wanted to abolish all hierarchies and bring everyone under the General Will of the State. The right, whether autocratic of constitutionalist, has never viewed the government as the final end of man. And as for now: Why is the public still hearing about Charlottesville? The media, the Democratic Party (the true home of racist, socialist policies, whether national or international), and left-wing academics and pundits are desperate to preserve the lie that these white supremacists are a central part of President Trump’s entourage, the core of the Republican Party in particular, and the motives of American conservatism in general. It’s a brazen fraud. President Trump condemned the violence on both sides last year. He was right to do so, because there WAS violence on both sides, and predictably so. Socialism (national or international) is invested in and defined by force, the use of violence to accomplish its ends. Whereas previous Presidents from both parties would only disparage the violence on the so-called right, President Trump also denounced Antifa, or the Alt-Left, for their violent behavior. Now it’s time to denounce the Alt-Right for what they are: small, obsessed with identity politics, racist, or more accurately racialist, establishing race as the foundation of everything in culture and community. They are adamant atheists and confirmed collectivists. The so-called “Alt-Right” is really just a pro-white response to the multicultural Left (special thanks to Michael Knowles and Dinesh D’Souza for these revelations). What happened at Charlottesville was not a clash between Left and Right, but Left and Left, between national socialists—specifically white nationalists—and global socialists and communists, nothing more.